UPDATE: Since this article was published, journalist Spiros Karatzaferis was arrested on an outstanding charge after claiming he would publish classified documents relating to Greece’s financial bailout. In recent months Greece has recorded multiple instances of censorship and attacks on the press. Systematic efforts to curtail media freedom are taking place against a backdrop of rising police brutality used to quell anti-austerity protests and mounting neo-Nazi violence against journalists, immigrants, and homosexuals linked to rise of the far-right Golden Dawn party, which gained 18 seats in June’s parliamentary elections (having achieved a record 21 seats in the May election). 28 October, National Day in Greece, saw the arrest of investigative journalist Kostas Vaxevanis, whose Hot Doc magazine published a leaked list (nicknamed the “Lagarde list”) of over 2,000 names of Greeks with bank accounts in Switzerland. Reporters Sans Frontieres appealed for his release, the OSCE Representative on Freedom of the Media, Dunja Mijatović, expressed her concern, and netizens rallied to his support on Twitter, gathering over 16,000 signatures on a petition demanding that charges be dropped, as did the European Federation of Journalists. “They are after me instead of the truth,” Vaxevanis stated in a video uploaded on the night before his arrest. A New York Times editorial slammed the Greek government for being “shamefully quick” to attack the messenger and strip basic social services from the country’s most vulnerable citizens but shamefully slow at probing possible tax evasion by the well-connected. Vaxevanis, whose magazine has been steadily publishing investigative reports on graft and corruption scandals, had reported a seemingly abortive ambush at his home on the northern suburbs of Athens earlier in September by five unknown individuals. Several other incidents of censorship have plagued the media in the last month, leading to international condemnation and grave concerns about the state of democracy in its nominal birthplace. 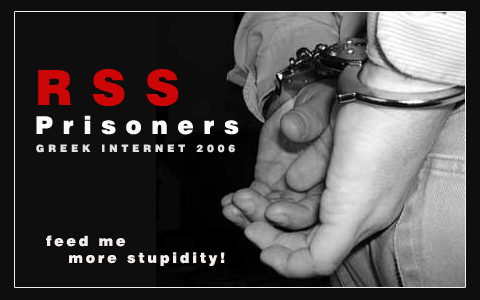 On 25 September, a 27-year-old netizen was remanded to trial on blasphemy charges for maintaining a Facebook page titled “Gerontas Pastitsios” (Elder Pastitsios), which included satirical comments on Christianity and the noted Eastern Orthodox monk Elder Paisios and his alleged“prophecies”, as well as the commercial exploitation of Paisios’s legacy. The matter was raised by a member of parliament from Golden Dawn. According to the defendant, the blasphemy charge was later dropped, but he still faces defamation and insult charges over third-party comments left on the Facebook page (he maintains he never defamed or used abusive language himself, and even deleted abusive comments). On 9 October, the Guardian published a report by the Nation’s Maria Margaronis on torture allegations made by anti-fascist protesters arrested after a clash with Golden Dawn members on 26 September, in which detainees spoke of being subjected to an “Abu Ghraib-style humiliation” at police headquarters in Athens. The Μinister of Public Order, Nikos Dendias, later announced his intention to sue the British newspaper for defamation and instead of ordering a public inquiry while investigating the torture allegations in a “sworn administrative inquiry”, a process described by the UNHCR in 2008 as an internal and confidential police procedure designed to protect the rights of the officer involved rather than those of the complainant. On 11 October, religious groups and neo-Nazis protested against the gay-themed play Corpus Christi in Athens, deeming it blasphemous; they assaulted a theatre critic and forced the cancellation of the performance. Five days later, Greek public television channel NET censored a gay kiss scene from the British TV series Downton Abbey. Management apologised after a furore online against censorship, and rebroadcast the episode uncensored. On 26 October, ERT3 state TV reporter Christos Dantsis, assigned to cover the celebrations of the liberation centenary of Thessaloniki, “disappeared” on screen, after reporting on citizen protests against the Greek Prime Minister and President of the Republic outside St Dimitrios’ church and the heavy police presence that had descended on the city. His substitute was ordered to present a more amicable image of festivities. On 28 October, a 35-year-old man arrested in Corfu for posting photos of police and Golden Dawn on Facebook during the Ochi Day parade, was reportedly charged with breaching privacy, defamation and “spreading false news with the intent to destabilise the state”. About an hour after the programme ended, the director of information called for a transcript. He didn’t ask to talk to us. And it was then announced that two other journalists would present tomorrow’s show. We were cut. Aimilios Liatsos, ERT’s general director, defended his decision and stated that the two journalists “violated minimum standards of journalistic ethics”. Various political parties and organizations have condemned ERT’s action, while journalists at ERT/NET launched a 24-hour rolling strike as of 30 October, until the decision on Arvanitis and Katsimi is withdrawn. Greece can no longer be called a functioning democracy […], as press freedom, always precarious in Greece where most private media are in the hands of well-connected oligarchs, is a dead letter. David Hughes of the Daily Telegraph underlines that “press freedom is under threat in Greece and the EU doesn’t seem to care”. Yiannis Baboulias similarly accuses European leaders of treating what is happening in Greece as a national problem, predicting in a New Statesman article that “they’re holding the door open for their countries to go down the same path”. An apparent lack of Internet policy and judicial ignorance of the nature of the internet had led to the first publicised incident of online censorship in Greece in October 2006. During the Internet Governance Forum (IGF) held in Athens, news emerged that Greek authorities had arrested Antonis Tsipropoulos, a Greek aggregation service administrator, and confiscated his hard drives, for linking to US-hosted blog posts that satirised Greek businessman and tele-evangelist Dimosthenis Liakopoulos. Bloggers organised a massive online solidarity campaign and held courtside protests, declaiming the lack of web savvy of the complainant and the court, as well as the technophobe spirit of the time. Tsipropoulos’ case was mired in legal limbo for years, as often happens in similar cases. Subsequent attempts over the years by Greek governments to institute “anti-blog laws” — similar to ones recently enacted in Jordan, Zambia and Malawi, among others — that would enforce mandatory registration and hold bloggers accountable for third-party comments, were held in check by netizen initiatives. Overt press censorship is banned by the Greek Constitution, but systematic efforts to curtail press freedom have intensified in recent years, as unpopular austerity measures, corruption scandals and police violence are fueling frequent protests and dissent. Greece notably plummeted 35 ranks in the Press Freedom Index published by Reporters Without Borders in 2010, in large part due to the assassination of online journalist Sokratis Giolias, allegedly because of his work on an undisclosed corruption story, and targeted police attacks on photojournalists covering protests. Human Rights Watch, Amnesty International and other international human rights organisations have repeatedly chastised the Greek state, urging a “zero tolerance” approach to police violence. Threats and abuse against journalists by newly-elected politicians from the neo-Nazi Golden Dawn party prompted CPJ to remark that the party “casts a shadow on Europe’s press freedom”. While Greece is widely and casually demonised as “patient zero” of the European financial crisis, politicians and the media are routinely displaying a callous shortsightedness in addressing its corrosive effects on press freedom and free speech, eating away at the core values that made the European Union a necessary reality. This is, in large part, to oppose the spectre of totalitarianism ever rising again in the continent. As Kostas Vaxevanis has written: “Greece gave birth to democracy. Now it has been cast out by a powerful elite”.